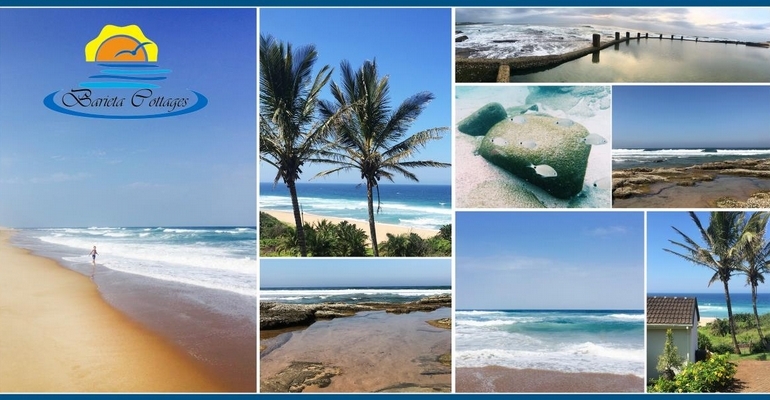 A warm welcome to BARIETA BEACH COTTAGES, situated at MTWALUME, a quaint coastal holiday& fishing village & well kept secret destination, which is approximately 90Kms south of Durban & 33Kms from Scottburgh, in the Ugu District of KZN. The BARIETA BEACH COTTAGES have access to an exclusive beach being a mere 60 steps away. The cottages are situated within a secure gated complex with the options of two-bedroomed cottages [six] as well as a four- bedroomed house [one], with allocated parking & braai facilities. It is a haven for cosy family stays - relaxing in the sun, swimming, fishing (various& abundant), dolphin watching, exploration of rock pools & coral reefs, including spear fishing. If per chance migrating whales might be spotted. At night you fall asleep to the sounds of the ocean to enchant you on a journey made of stardust. For the purpose of shopping, Mtwalume itself has two shops for bare necessities & a post office. The BARIETA BEACH COTTAGES are proudly owned & managed by Barry & Marieta Griesel, who are committed to customer satisfaction & service excellence at affordable accommodation rates.